A corrugated packaging producer in Andover, NJ, reported being required to pay a user fee for manufacturing a "litter generating product," despite the fact that corrugated containers are often recycled or made from recyclable materials. March 29, 2018 – The New Jersey Senate has passed Senator Steve Oroho's bill to protect box manufacturers from paying unfair user fees, by modifying the definition of “litter generating products” under the Clean Communities Program Act to exclude corrugated containers, which are principally made from recyclable materials. Senator Oroho drafted S-534 after a box maker in his district, Sutherland Packaging in Andover Township, reported being required to pay a user fee for manufacturing a “litter generating product,” despite the fact that corrugated containers are often recycled or made from recyclable materials. S-534 would modify the definition of “litter-generating products” under the Clean Communities Program Act to exclude corrugated containers. This would protect box makers in New Jersey from paying the user fees imposed on businesses who manufacture commonly-littered items, such as glass containers, paper products and disposable packaging. Corrugated containers are fiberboard boxes often used for shipping merchandise, or as pop-up product displays in grocery and retail stores. 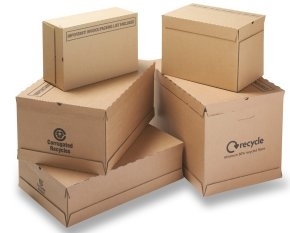 47 percent of all corrugated containers are made of recyclable materials. More than 92 percent are recovered and reprocessed into fresh packaging by the very manufacturers who initially sold the products.